Home » Free » Oricotori: Birdie the Third! 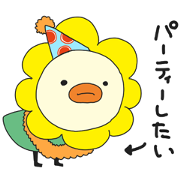 Oricotori from Orient Corporation returns to LINE with a third sticker set! Popular illustrator wakuta brings a distinctive style to these special stickers. Friend Orient Corporation’s official account to get the set for free. Title : Oricotori: Birdie the Third!